Are you going to export, invest, or penetrate a target market? We know how difficult is being always up to date in a fast-moving world. Technologies, quality of raw material, new trends, and an increasing competition force you to make decisions in a very short time with few and exact data and information. This is the reason why we decided to be extremely vertical when we study the coffee industry and to analyse the only markets we have known for years: Coffee (R&G, Whole bean, Portioned, Instant/Soluble, RTD), Equipment for coffee (Espresso Coffee machines, Filter Coffee machines, Liquid Coffee machines, Pod machines, Commercial Grinders), Machinery & plants for coffee processing (Roasting machines/ plants, Industrial Grinders, Dosing, Filling & Wrapping machines). This high competence, built over years of experience, makes us very quick in delivery, calibrated in data information, and deep in our analyses. You can choose your target country, your product target (i.e. beans, pods, espresso machines, etc.) and the type of analyses you want we carry out for you. Some reports are ready to buy in our store, but the added value of our experience is calibrating our analyses to your specific objectives. So contact us if you don’t find what you are looking for in our store and we will tailor our analysis to your needs. [A] Market Size: The coffee and/or coffee machine market in value and volume, an overview of the main changes in the markets, with the main trends of imports and exports. [B] Market Split: The total market split between Home (H) and Out of Home (OOH) markets in value and volumes. 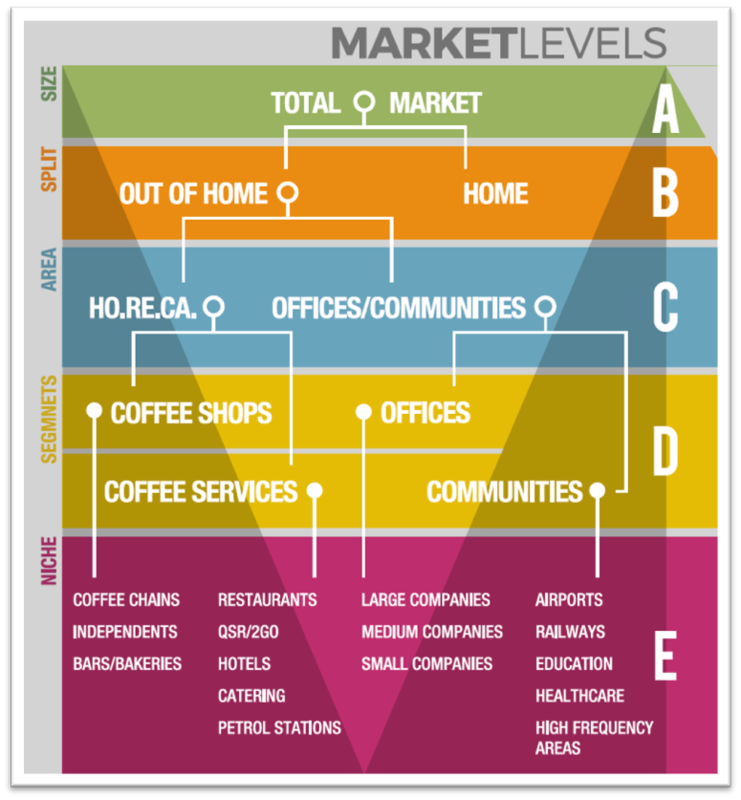 [C] Market Area: The in-depth analysis of the Out of Home (OOH) segment divided into HoReCa and Office/communities. [D] Market Segments: instead of the consolidated figures, with this option you receive a further breakdown for every segment. 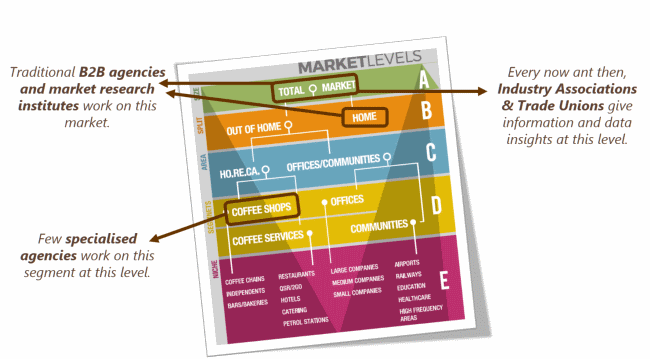 [E] Market Niche: The market fragmented into micro segments, to get an unprecedented level of detail for coffee distribution. Turn your strategy from a passive to an active purchasing approach. Purchasing of raw material is the first cost element of the balance sheet of roasting and distributors’ companies. Price fluctuations could be important, since the historical minimum of 1 euro per kg from 2003, went up to 4,5 in 2010. Consequently, companies usually buy the quantity they need for production in a continuous manner or, to stabilise the price, buy future contracts. This passive approach is certainly safe but this is a sort a condemnation to compete in market only in the field of the operative costs. But as the added value in the market is not high, the price competition erodes your margins if you are not particularly able to differentiate your product in terms of having a particular premium price. So, how to try to speedily regain margins? Buying raw material at a lower price than the competition does. It means turning from a passive to an active purchasing approach, and this different approach could also generate millions of euros at the bottom line. CoffeeBI offers a service of personalised consulting to support you to make purchasing decisions and be an active subject on the market. The service is based on an annual fee. Competition & Shares Reports are highly customised analyses with several levels of depth for products and a breakdown for total shares, based on business type (HoReCa and Office). Our consultants will support you analysing the competitive scenario basing on your needs and objectives, and they will assist you before and after your purchase. Our clients recognise us the excellent service and the ability to help them reaching their objectives. From the coffee industry to the coffee industry, our reports go straight to key information without a huge amount of useless pages and repeated data. CoffeeBI’s methodology is top-down: starting with a country’s scenario, macroeconomic dynamics, trends of the main indicators, import-export of coffee as well as machines and transformation of coffee for both the local and foreign markets. CoffeeBI analyses include data and values that come from an extensive usage of both primary and secondary data sources, calculated according to 1) In-company elaborations of production, financial statements, sales data; 2) Export and import by countries; 3) Current market trends; 4) Upcoming technologies and the technical progress in the coffee industry; 5) Market risks and opportunities; 6) Market barriers and challenges; 7) CoffeeBI’s internal database; 8) Qualitative interviews with managers and opinion leaders in the coffee industry; 9) ICO bulletins, Eurostat, Trade associations, etc. 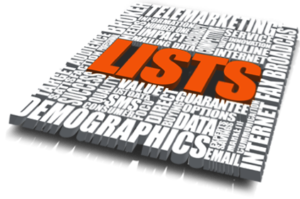 Information on companies (business profiles, strategies and market share) are collected from public sources (annual reports, company information), interviews (face to face or by telephone), deep qualitative interviews with coffee industry experts, market leaders, sellers, and associations. CoffeBI calibrates the collected data with a set of interviews (on the phone or face to face at trade shows) with industry operators and opinion leaders (experts who have been working in the coffee trade for decades) who collaborate with CoffeeBI’s editorial team. In addition to this, being a partner of various trade magazines, we have a constant influx of information which is always fresh from the various markets. Last, but not least, we always double check the consistency between the information flow of the coffee sector and that of coffee machines. In order to get the best results for these analyses and achieve time/cost savings for the investment, CoffeeBI offers a modular approach that separates the market analysis (which requires information to be collected and processed within a limited period of time) and an analysis of competition (which requires information to be collected through company interviews which requires more time and is likely to generate additional costs). 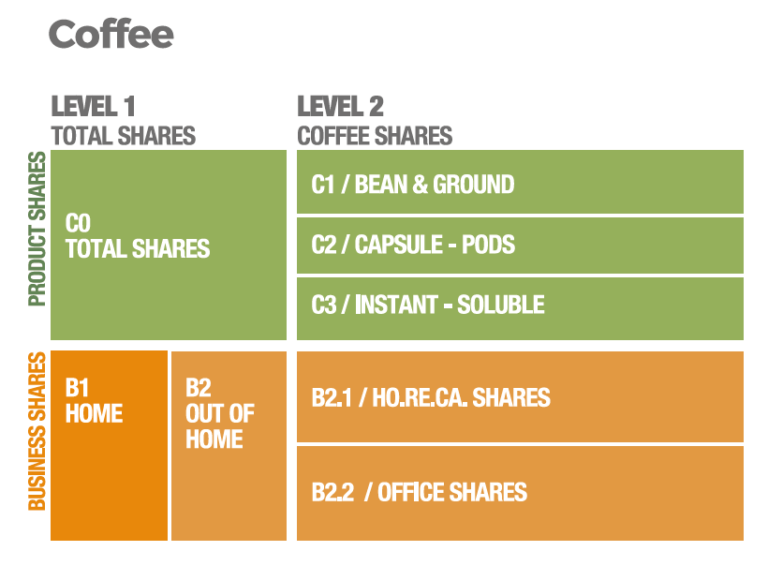 This enables CoffeeBI to have an overview of the market at levels A (general market) and B (Away from home). Furthermore, in a granular way, CoffeeBI breaks down the data and repeats the same procedure for each sub-segment, double-checking them with data based on the dynamics of the individual segments and sub-segments (number of bars that open and close in the country, hotels by category that open and close, offices, etc. ), and data on consumption, employees and trends. 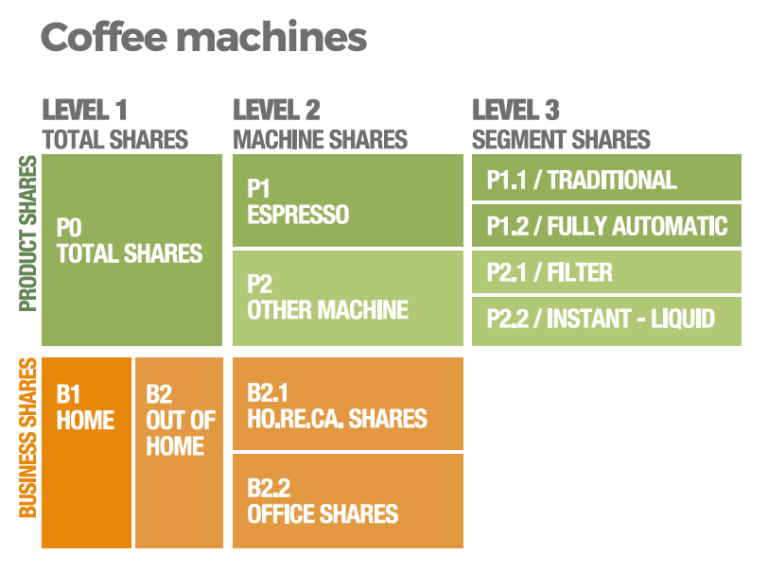 This enables CoffeeBI to obtain the levels D and E. Once deconstructed, the data is reconstituted to make level C and a double “bottom-up check” from level E to A, and from A to E. The prices are all sell-in prices for coffee and ex-factory prices for coffee machines. Thanks to this methodology, we can adapt the categories based on our clients’ definitions of the required categories. This also explains why CoffeeBI’s data only takes a short time until it is ready, it goes straight to our client’s objectives and it can be calibrated according to the customer’s specific needs.